Anne Ward, Free for All, acrylic, 24×30 in. 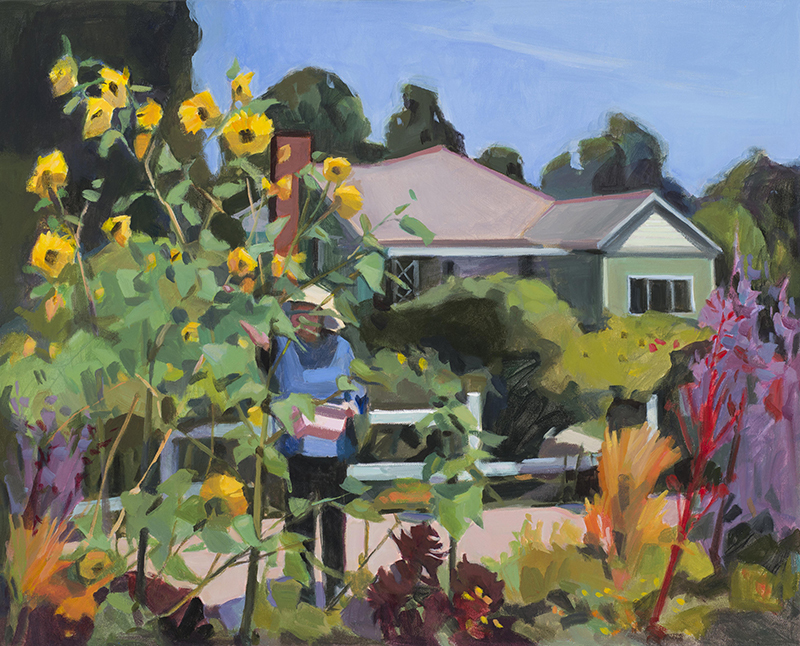 Marcia Burtt Gallery presents “At Home,” paintings depicting scenes of our daily lives. Gardens and cut fruit and flowers inhabit Anne Ward’s suburban tableaux. Tablecloths and sunflowers replace fields and trees; staged decorative motifs echo and mirror bigger landscapes. Decorative themes weave through the lush botanical paintings of Michael Ferguson and Randall David Tipton. Isolating the floral from the larger world allows for focusing on line, shape, and color of stems and leaves. Meg Torbert abstracts floral elements in her still life interpetation. Contrasting planned suburban topography with untamed nature, Marcia Burtt’s and Patricia Doyle’s energetic big brush marks and bold colored gardens suggest the limit to which nature can be controlled. Stepping simultaneously farther out and closer in, portraits of our communities are offered by Erling Sjovold, Robert Abbott, Susan Petty, and Marilee Krause. Nature peaks through the stage-front buildings in Krause’s and Petty’s works on paper. Sjovold’s and Abbott’s towns and houses are dominated by our local mountains. From close up to the bigger picture, all these works are not simply illustrations of our homes and neighborhoods, but evince planning and choices made by the artists who created these designed landscapes. Michael Ferguson,Yard Poppy, acrylic, 32×30 in.